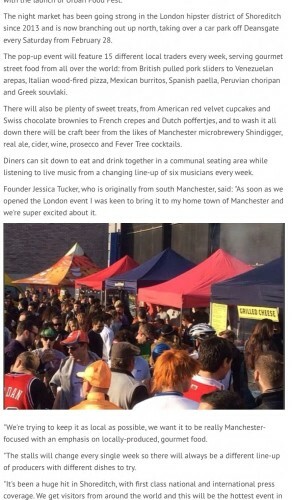 Manchester will welcome next weekend, the launch of Urban Food Fest. The night market has been going strong in the London hipster district of Shoreditch since 2013 and is now branching out up north, taking over a car park off Deansgate every Saturday from February 28. The pop-up event will feature 15 different local traders every week, serving gourmet street food from all over the world: from British pulled pork sliders to Venezuelan arepas, Italian wood-fired pizza, Mexican burritos, Spanish paella, Peruvian choripan and Greek souvlaki. 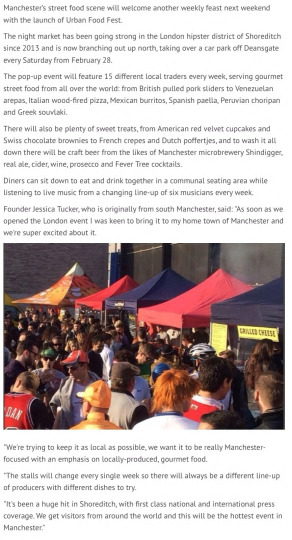 There will also be plenty of sweet treats, from American red velvet cupcakes and Swiss chocolate brownies to French crepes and Dutch poffertjes, and to wash it all down there will be craft beer from the likes of Manchester microbrewery Shindigger, real ale, cider, wine, prosecco and Fever Tree cocktails. 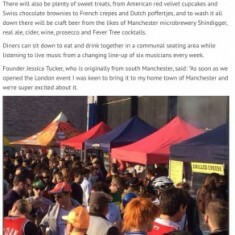 Urban Food Fest will be held at the Euro Car Parks at 2-6 Bridgewater Street, Deansgate, M3 4LY, from 5pm to midnight. Entry is free. The street food festival celebrates all things end-of-the-20th-century as it continues its residency in Manchester city centre. Manchester’s latest foodie festival is going back in time with a special retro event this Saturday night. The Urban Food Fest street food has been going strong in the London hipster district of Shoreditch since 2013 and is now branching out up north,taking over a car park off Deansgate every Saturday. ‘Super Mario Bros’ vegan falafel & hummus wraps. Desserts include ‘Honey I Shrunk the Kids’ cookie & chocolate fudge slice, Bill Clinton’s almond tart & the ‘Fresh Prince of Bell Éclairs’. There’s also a premium bar serving craft beers, cider, international wines & prosecco, alongside bespoke cocktails including the ‘Jurassic Park’ vodka, lime & Fever Tree ginger beer cocktail and “Saved by the Bell-ini” Duppy Share rum, cucumber & blueberry cocktail. All that can be enjoyed in communal seating areas, accompanied by 90s tunes from live musicians and servers dressed in themed costumes. And if you really want to get into the spirit, there will be a free craft beer or cocktail for everyone in 90s-themed fancy dress!